It is day. the ground is stone. The city is in the background. there is a man sitting on a gold chrome horse. the man is 2 feet tall. 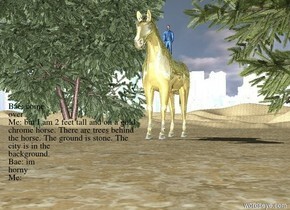 there are trees behind the horse. it is sunset. the ground is dark blue water. there is a hot pink chrome skull next to a blue chrome skull and a pink chrome skull. 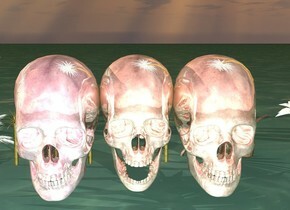 there are 10 pink chrome palm trees behind the pink chrome skull. the palm trees are 5 inches tall. there are 3 chrome palm trees behind the blue chrome skull. the ground is water. 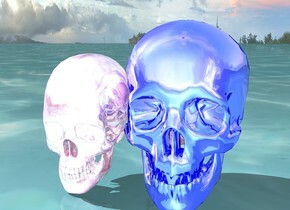 there is a hot pink chrome skull next to a blue chrome skull next to a chrome skull. 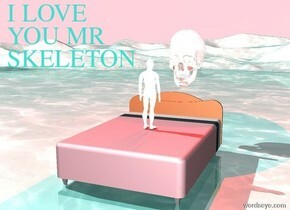 there is a small chrome man on a pink bed. there is a huge chrome skull 1 foot behind the bed. the skull is 3 foot above the ground. the man is facing the skull. there is a red light above the skull. there is a huge dark red light to the left of the man. the water ground is turquoise and small. the sky is pink. the man is not afraid. It is sunset. the chrome ground is turquoise. The chrome dolphin is 10 feet tall. The dolphin is hot pink. A chrome pizza is below the dolphin. The chrome palm trees are pink. 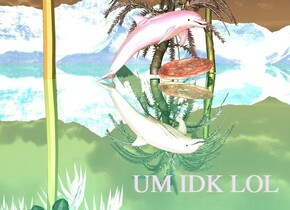 A pink chrome palm tree is behind the dolphin. A chrome pizza is 10 feet wide. 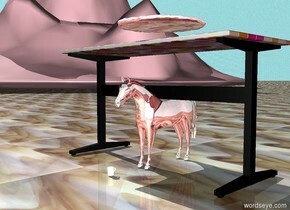 the chrome pizza is 3 feet to the right of the dolphin.The chrome pizza is leaning right. The mountains are in the background. The ground is glass. 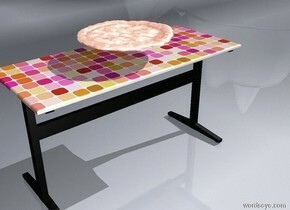 The sky is water.The chrome pizza is 5 inches above the mod desk. The pink mountains are 50 feet tall. The mountains are 30 feet from the desk. The chrome horse is 2 feet tall. 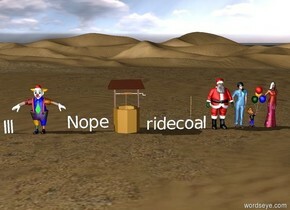 The horse is under the desk. The chrome mug is in front of the horse. The mug is 2 inches tall. The ground is chrome. 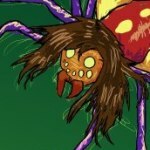 The sky is grass.The chrome pizza is 5 inches above the mod desk. The chrome mountains are 50 feet tall. The mountains are 30 feet from the desk.